DAY 300 – “No Consent To Proceed”! Grass roots campaigners and International NGOs joined forces in Kuala Lumpur today to ram home the realities about the Baram Dam, pet project of Taib Mahmud. In summary, they pointed out the plan has no legal right to proceed and flies in the face of a long list of legal obligations that the Sarawak State Government has been doing its level best to ignore. Baram is just the first of 12 proposed new dams to be built under Taib’s SCORE plan and it would inundate 400 square kilometers of jungle and displace 20,000 people. If the rest of the dams were to be built more than 2,100 square kilometers of Sarawak would drown under water, along with the homes of tens of thousands. Today, the expert NGO International Rivers presented its own report on the Baram Dam proposal, coinciding with the 300th day of determined opposition to the dam by local indigenous peoples. It represents yet another careful analysis of the proposed dam that has ended up condemning Sarawak’s approach to the issue. Malaysia’s own official human rights body, Suhakam; theMalaysian Bar Council, the human rights body Suaram and the Swiss-based Bruno Manser Fund have all released similar reports condemning corruption and irregularities in the so-called SCORE programme. And a short while ago a key Oxford University report raised severe concerns about the economic benefits of mega-dams as a tool for development altogether. Indeed, the Oxford report concluded that more often than not mega-dams turn out to be costly white elephants that drain the host countries of valuable finance. This week Vietnam, which had also been sold the idea of mega-dams, took heed. The country announced the cancellation of no less than 12 planned mega-dam projects. Exactly the number that the majority of the native people of Sarawak wish that the Taibenan Satem regime would scrap in the state. Taib won’t take “no” for an answer….. But, in doing so he is violating the rights of the people. And yet, Governor Taib Mahmud and his Chief Minister Adenan Satem, have made clear that they are dammed well determined to proceed. No wonder, since Taib’s family companies stand to make billions from the dodgy ventures, which China’s Three Gorges Dam Company are only too happy to practice their skills in building, thanks to massive loans from their own government. It is the people of Sarawak who will have to pay the money back. As all the reports on Sarawak’s dams point out, the first step towards justifying any of these dams legally is to produce a half decent reason for building a structure that will destroy world heritage nature and the homes and cultures of the people of the land of Sarawak. But, take a look at the now published Impact Assessment on the latest Murum Dam. Murum’s ‘statement of need’ is nonsense, because it is based on an impossible concept. None of Bakun’s power can be used by West Malaysia….. so what kind of nonsense justifies 12 yet further dams, starting with Baram? …..except, as the world knows, Bakun is unable to send its power to West Malaysia, because the technology does not exist! So, the ‘statement of need’ for Murum is a figment of imagination, based on a technical impossibility. Which is why Bakun is currently only able to use 50% of the electricity it is generating and there will be no need whatsoever for the electricity generated by Murum. So, what possible ‘need’ will there be for the electricity generated by Baram …… and then 12 more dams? This is not about making electricity, plainly. It is about breaking the Dayak people of Sarawak and making billions for Taib Mahmud’s construction companies. Read International Rivers’ latest report. 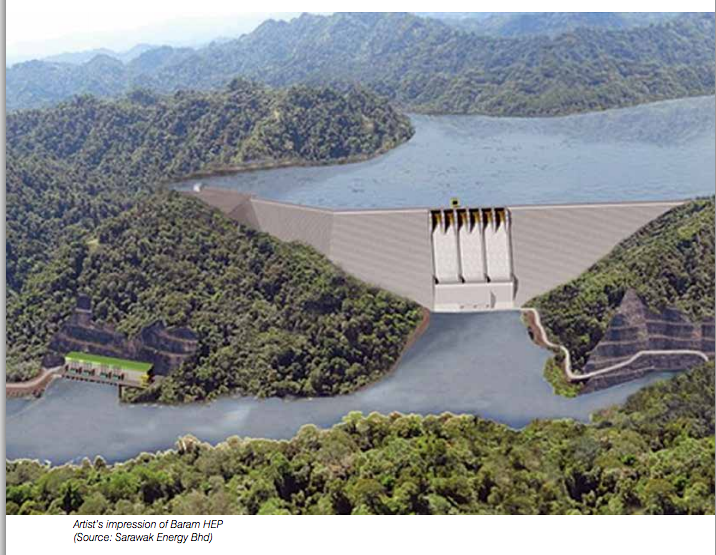 Artist’s impression of the planned Baram Dam…. 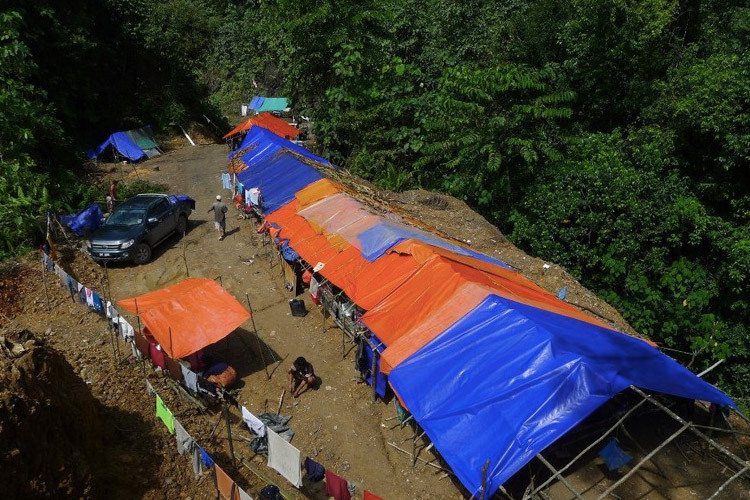 Kuala Lumpur: A blockade to resist a hydroelectric dam in Baram in the Malaysian state of Sarawak marks its 300th days today on Monday 18th August 2014. As an event for the occasion, a group of villagers from around the proposed dam site are in Kuala Lumpur to participate in a forum at the nation capital. The forum was specially organised to launch a report from a human right fact- finding mission done in Baram related to the construction of the Baram dam. At the forum, the delegation from Baram is testifying on the findings of the mission. 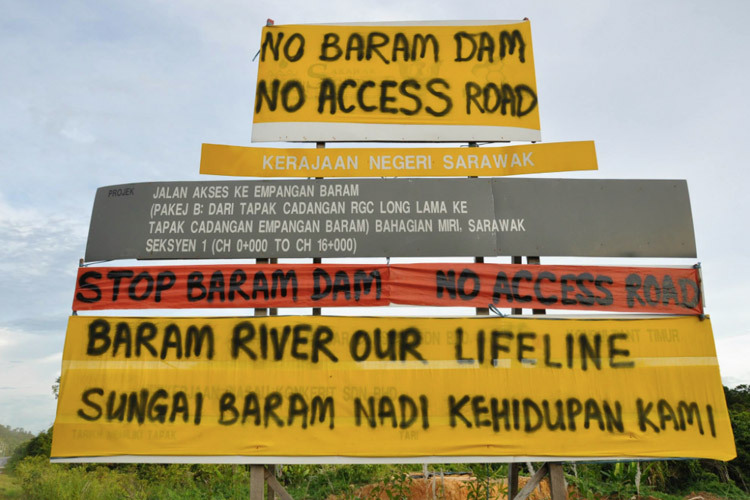 There have been so many allegations of widespread human rights abuses committed by Sarawak Energy Bhd (SEB) at the proposed site of the Baram dam. In response to these allegations a study by an independent group was arranged at 15 villages in Baram last February. The finding of the study group was being evaluated with reference to Malaysian and international human right guideline. 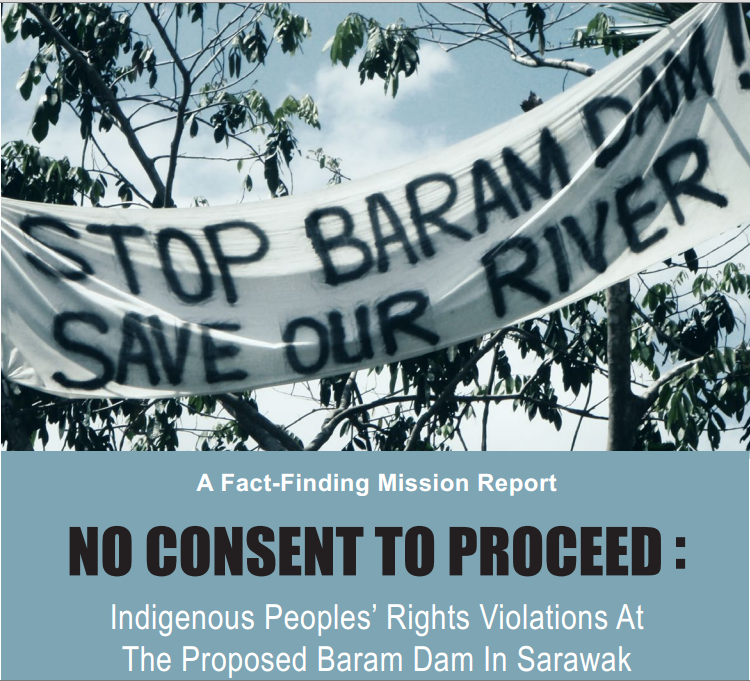 Based on the study, the action by SEB and the Sarawak Government to begin preparation for the construction of the Baram Dam violate provisions of the Malaysian Federal Constitution and the UN Declaration on the Rights of Indigenous Peoples. The published report from the study highlighted seven specific categories of none compliance committed by SEB in Baram, which are as follow: (1) Denial of right to information and lack of transparency about the impact of the proposed project, (2) Lack of respect for the principle of free, prior, and informed consent; (3) Violation of the rights to meaningful participation; (4) Extinguishment of customary land rights; (5) Violation of the right to livelihood; (6) Use of coercion against villagers, including the issuing of punitive measures, threats and intimidation; (7) Violations of the rights of indigenous peoples to self-determination. In the report, the facts finding mission gave a set of important recommendations to Sarawak Energy Bhd and the Sarawak Government to be in compliance to national and international requirement. On the same day, the report was officially handed over to SUHAKAM, the Malaysian Human Right Commission with a request for the body to – “Take immediate measure to launch an independent detailed investigation into the allegation of SEB’s act of corruption and coercion of the villagers in Baram.” The report will also be handed over to institutions that are considering investing in the Sarawak dams. SAVE Rivers is a grassroots network of indigenous communities and civil society organisations in Sarawak, working to protect human right and stop destructive dams in Sarawak.